Established in 1997 in the early days of online sports betting, Sportbet has witnessed some changes throughout the years. After a change in ownership, this online sportsbook is now part of the 5Dimes family with a trusted and reputable management team behind it. What Sports are Available to bet on at Sportbet? 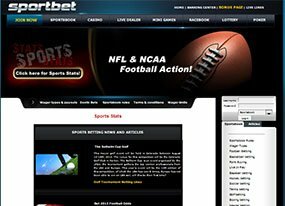 This online sportsbook boasts an extensive list of the biggest leagues in North America – including the NFL, MLB, NBA, NHL and college basketball and football. You’ll also find international sports like cricket and rugby, and niche sports like wrestling and darts. There’s even a racebook. There are plenty of betting options and types available for any wager you’d like to make. Whether you’re looking to make straight bets, prop bets, futures, parlays or teasers, Sportbet has you covered. Sportbet offers Live In-Play betting with many wagering options like straight bets and parlays. You can bet on each at-bat, play, run and pitch, depending on the sport. Unlike other online sportsbooks, the deposit options for Sportbet are limited. You don’t have a huge array to choose from, so hopefully they start accepting e-wallets in the future. The deposit options for Sportbet are credit cards, person to person (P2P), money order, Bitcoin, sportsbook transfer, and account to account transfer. The only currency offered at this sportsbook is American dollars. But bettors can always be assured that their money is safe with Sportbet’s protected accounts with secure encryption. At Sportbet, they always consider their customers by offering generous bonuses and promotions. New customers can choose between a selection of bonuses to make sure they receive the appropriate bonus that fits their wagering needs. When you sign up for Sportbet, you can claim their Welcome Bonus. You get 50 percent of your first deposit up to $520 which can boost your bankroll quite a bit. If you have friends – and you probably do – why not refer them to Sportbet? With the referral bonus, you get 20 percent of your friend’s opening deposit. The more friends you refer, the better your bonus. The only thing to keep in mind is that you must claim your bonus within 24 hours of your friend signing up for Sportbet. Also, the bonus is capped at $200. When it comes to sports betting, there’s no guarantee that you’ll win. Sportbet takes that into consideration and offers a cash back program where you can recoup up to 20 percent of your losses. The only downside to this program is that the terms and conditions are very long and the more cash back you request, the lower the percentage you’ll get back. The one downside to Sportbet is their mobile offering. They do not have an optimized mobile site, which is unfortunate for those who like to place their bets from their phones and tablets. The internet site does work on your smart device, it just doesn’t look right on a smaller screen. Players from the United Kingdom are excluded from playing at Sportbet. Americans, Canadians and players from most Latin American countries are welcome. Is Sportbet the Right Sportsbook for Me? Though the name Sportbet strongly suggests that they only offer sports betting markets, that couldn’t be further from the truth. They are a one-stop shop for all your online gambling needs with sports betting, an online racebook, casino gaming and a poker room – all tied to one singular account.